The SwissBorg project aims to revolutionize wealth management services with a community-centric approach powered by blockchain technology. Public sale Date: 7th December 2017-24th December. SwissBorg is a decentralized banking backbone built around community-centric values. It offers Best of Breed Financial Advisory services and Invest Solutions to everyone with no frontier or restrictions. A place, where you can safely store & manage your crypto assets by getting access to a large number of asset services: from asset tokenization to derivatives and exchanges traded place. A bank, tailored to anyone from individuals to DAOs with no minimum deposit. A New paradigm, where Financial Advisor & Investment Manager deliver their added value with no filter and in full transparency. Today, investors want more personal, real-time and effortless experience. The clients’ onboarding-process is complicated, time-consuming, and not portable. The KYC process is also expensive for banks. Investors have to deal with predefined portfolios with inadequate support and financial advisors that leave them in the dark with no control over financial decisions. Clients have to deal with misguidance and imprecise information on their investments entrusted to financial advisors. Customized investment solutions are reserved for the elite private banking client base. Profitable investment opportunities are restricted to high net worth individuals. There is a very strong call for benchmarks to monitor and track the behavior of cryptocurrencies. The number of cryptocurrencies funds available remain very limited and yet, it is difficult for investors to compare them, as there are no market indexes to do so. There are few investment solutions/strategies or financial advisors available to crypto-holders. Cryptocurrencies do not offer the option to mandate a third party (human or robot) to manage their wealth and protect is against operational risk, counterparty risk, fiscal risk. The process of managing cryptocurrencies (i.e. depositing, withdrawing, transferring, and investing) involves a presumed degree of awareness that can be eased by reshaping user interfaces. Individuals and DAOs benefit from democratic, transparent and truthfulness investment services to manage their crypto-wealth. Investment managers and financial advisors benefit from crypto asset classes and the best-of-breed technologies (Blockchain & Al) to better serve their clients. Enables holders to have a vote. Enables holders to receive a share of the revenue from the SwissBorg network. Similar projects: Tokenbox, Iconomi, melonport, Protos, etc. Divided Token: YES. Quarterly revenue from fees. 25% of revenues in ETH using smart contracts. Market dynamics: There is approximately 120 trillion USD of client assets managed by global wealth managers, and 4 out of 10 clients are open to switching wealth managers under the right circumstances. This represents a 175 to 200 billion USD global revenue opportunity. 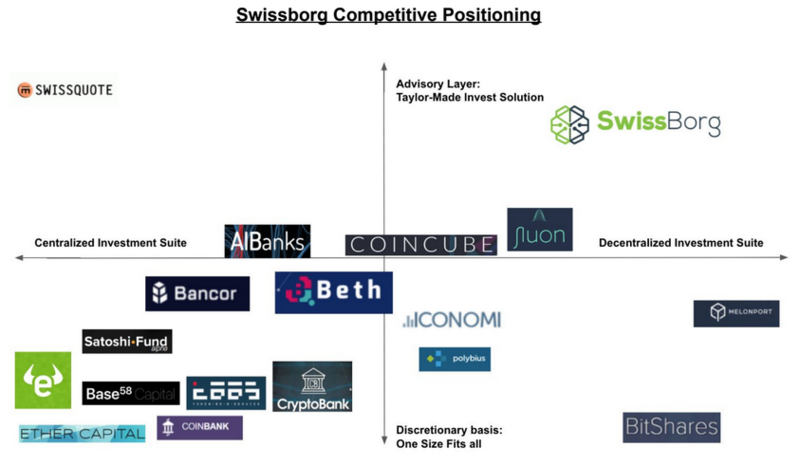 Sources of revenue: SwissBorg will receive management and performance fees by providing investment solutions to the community; SwissBorg will receive trading fees by providing investment services for the community. Use cases: Wealth management services, crypto bank, exchange, loans, trading. 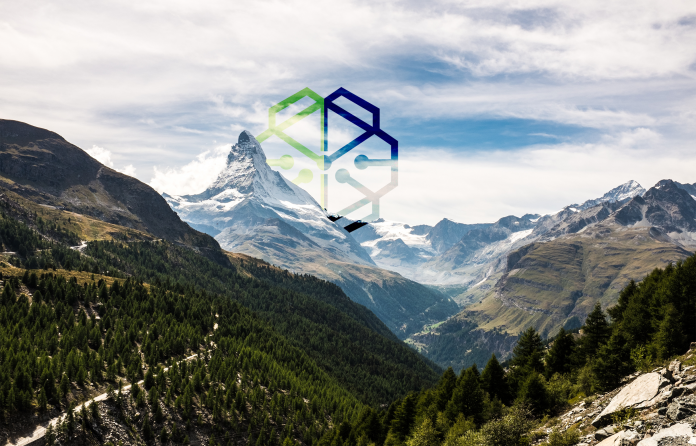 Regulatory risks: SwissBorg will be a Swiss Cooperative entity; the founders aim to become regulated in Switzerland with FINMA; it’s a revenue token. Any previous activity related to the project: Since 2015, SwissBorg has been building the next generation of Robo-Advisor by using Al in wealth management, with models crafted by experienced Hedge Funds Managers. By extending the Al Robo-Advisor model to cryptocurrencies, they intend to empower investors with more control and freedom of choice on trading activities and risk management. Actual alpha, beta etc. available on website: NO. Token expected usage date: Not a utility token. Working product: They are now raising funds for their first tokenized cryptocurrency hedge fund that offers 50% of dividends to holders. The CSB token for the hedge fund is being sold at $3 per unit. Smart contracts: Used to manage the process of redemption/subscription to crypto indexes; The derivatives will be created as preprogrammed smart contracts, capturing the obligations of the two counterparties (such as margin agreements or swap conditions); Smart contracts could conceivably be written to automatically prepare business and corporate tax returns. Tokenization: Tokenization of physical assets such as diamonds, art or real estates; Token-backed loans. Transparency: SwissBorg Cryptographic Dashboard would enable financial advisors and investors to track and manage the state of their digital assets in real time. Regulators could also have a real-time view of what is transpiring in the system at all times. No Registration required: NO. There is KYC/AML preregistration. Token scarcity: 1 Billion CHSB; Unsold tokens are not burnt but are reserved. Limitations: US, Singapore, South Korea or the People’s Republic of China (excluding Hong Kong, Macau and Taiwan) (“PRC”). Presale amount reached: No Presale. Public sale Progress so far: Soft cap reached.